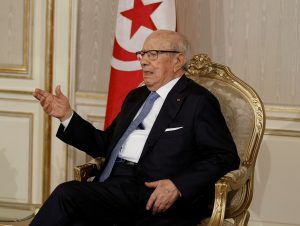 Tunisian President Beji Caid Essebsi has rejected claims by western countries and media that the democratic wind which swept away in 2011 several Arab leaders, including his predecessor Ben Ali, was an Arab Spring. For Essebsi there has never been such a spring but rather a Tunisian call for change of regime and system. In an interview with London-based Pan-Arab media “al Quds al Arabi” the Tunisian President argued that the so-called Arab Spring was a western invention. “I was invited to the G8 in 2014 (…) I was told there was an Arab Spring. Where is that Arab Spring? It was a western invention (…) I therefore told there was no Arab Spring but simply the beginning of Tunisian Spring (…)” Essebsi said. The 2011 movement which birthed in the North African country snowballed to Egypt, Libya taking along the leaders of these countries. Other Arab leaders survived the wind after adopting democratic reforms or quickly putting off the sparks. Commenting on the current situation in his country, Essebsi argued that despite the numerous challenges shaking Tunisia, the country has been able to establish new principles that just require time to soak up. For the Tunisian President, the North African country has been able to overcome the turbulence thanks to its history and the strength of its women. Posted by Jaber Ali on Oct 13 2016. Filed under Headlines, World News. You can follow any responses to this entry through the RSS 2.0. Both comments and pings are currently closed.